Vedanta, a chain of budget hotels in India, has Vedanta Wake Up! 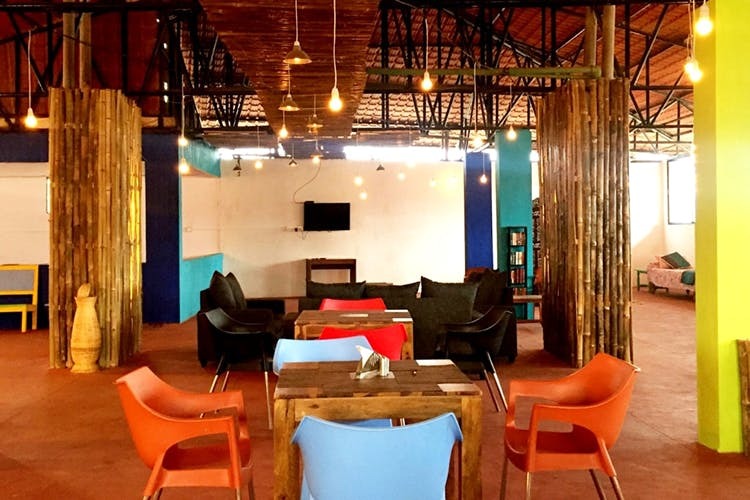 in Coorg, and this backpacker hostel is perfect for a budget weekend getaway for prices as low as INR 299. Vedanta has loads of hostels and hotels in Kerala, Tamil Nadu and Karnataka. With its blue and white exterior and a funky car painting on the wall, walking into Vedanta Coorg is quite pleasing and they have used a lot of blue, which is great. Vedanta doesn’t have much in terms of decor but has a nice common room to sit and relax in. Solo travellers, backpackers and families are welcome here, with room choices for all available. The common area is littered with sofas and bean bags, with activities like board games and even an indoor net! Sit down on their comfy sofas and watch TV instead, or make full use of the free Wi-Fi, you’re covered here. The hotel has 14 double rooms and 22 dorm beds. A single dorm bed can be booked for as low as INR 299 and the double room costs as low as INR 1,099. Family rooms with 3 beds can be booked for as low as INR 1,999 but rates might increase in the following months. Each dorm comes with air conditioning, lockers and an attached bathroom. Family rooms and double rooms have attached bathrooms and TVs in the room. There’s a laundry service and room service along with a 24-hour reception here as well. There’s an option for an added complimentary breakfast at a higher rate, for all room choices. Visit the Dubare Elephant camp to feed elephants or even sit in the river and relax. Head to the nearby Abbey falls for a beautiful view and some good pictures. The Raja’s Seat Mantapa is a good place to watch the sunset, the view and some spectacular greenery. To eat, drop into Tiger Tiger for some ethnic Kodava cuisine including Pandi curry, rice dumplings and chicken cutlets. You could even go to the Coorg Cuisine for some beetroot halwa, pork and coffee.